The effects of immigration and migrant workers on local communities have been examined in a BBC documentary. Filmed in Wisbech, The Day The Immigrants Left explored what might happen when unemployed workers took on jobs occupied by migrants. 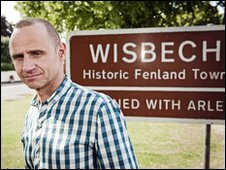 Presenter Evan Davis also looked at how schools and the NHS were coping with the town's estimated 9000 immigrants, many from Central and Eastern Europe. The documentary was shown on BBC One on Wednesday 24 February at 9pm. Would you want to work in a potato factory, harvest vegetables in the chilly flatlands of The Fens, lug bricks around a building site or work all hours in the heat of a busy restaurant? And would you want to do it in Wisbech? 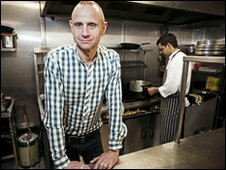 That was the challenge laid down in Evan Davis's one-off special, The Day The Immigrants Left. Twelve unemployed locals were asked to take on roles currently filled by migrant workers in the town - but how did they fare? "The conceit of it is to take immigrants out of Wisbech and to see how life continues there. "We hear a lot of people saying that the immigrants have stolen our jobs, that there aren't any opportunities for Wisbech people. "There are mixed results in the experiments we've done," he said. "Some, you could see that the British workers were up to the job and could do it. And quite a few where you could say that the British workers didn't put their backs into it, didn't want to put their backs into it, or couldn't put their backs into it. "What's undoubtedly the case is that a lot of these jobs are back-breaking jobs, and there is not a lot of demand by British workers to do these." We'd like to know what you think about migrant workers in this region. Are they taking jobs away from the unemployed, or filling roles that perhaps you, yourself, wouldn't even want to try? You can get in touch with BBC Radio Cambridgeshire while we're on the air or use the form at the foot of this page to email your comments. And if you watched The Day The Immigrants Left, please do get in touch and let us know what you thought.